How fitting is it that we all spent an hour with Trisha Yearwood’s deer-stealing ancestor last night… and we get to spend an hour today with the records of the federal penitentiaries as part of the National Archives’ Virtual Fair? It’s at 1 p.m. Eastern time today that Jake Ersland, National Archives at Kansas City, Missouri, presents the facts about Federal Penitentiary Records and the goodies you can find in records of prisons at places like Alcatraz, Atlanta, Leavenworth and McNeil Island. You have to love mugshots. But the National Archives of the United States, with the record sets it offers, is hardly the only repository of records about crime and punishment — and not the only place to find mug shots online — not by a long shot. 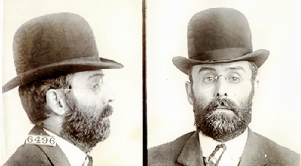 • The Nebraska Historical Society has a set of mug shots online in a gallery called Doing Hard Time: Historic Nebraska Mug Shots. • The Lloyd Sealy Library of the John Jay College of Criminal Justice has a whole image collection called the Crime in New York 1850-1950 Image Collection. Using the search term mug in the search box turns up an amazing set of images — many of death row inmates who were later executed at New York’s Sing Sing Prison. • The Alabama Department of Archives and History has a collection called Civil Rights Era Mug Shots. • The New Orleans Public Library City Archives has a collection called Hidden from History: Unknown New Orleanians, which includes a number of mug shots. • There are at least nine mug shots tucked away in the photographic collection of the Wisconsin Historical Society website. Use the search term mug shot to see them. And there’s more from around the globe. • The Tyne & Wear Archives & Museums has a set of mug shots online entitled Criminals of 1871-1873, from the Newcastle City Gaol and House of Correction Collection. One of the youngest photographed was a 12-year-old girl sentenced to hard labor for stealing a pair of boots. • The State Records website of New South Wales has an entire Crime in the records gallery that includes Gaol photographs. • Or try the set of wanted posters included in the Flickr photostream of the Nova Scotia Archives. You just have to love mugshots. Speaking of the fascination with mugshots . . . The ones we are used to seeing here in the U.S. are like the one in this post — a side view and a front-on facial shot taken as separate photos and then usually displayed side-by-side. I recall touring Kilmainham Gaol in Dublin a few years ago and seeing a clever Irish solution to the time and money cost of multiple shots that also yielded both side views of the criminal (and so could capture marks, scars or other distinguishing features on each side). Mirrors were set up so that with a single shot the photographer got a front facial view and both side views in a single photograph! That makes a lot of sense, doesn’t it, John? Just imaging two sides can leave some features undisclosed.